I have asked for questions on my Twitter, Facebook and Instagram and I got some great questions, so today I am going to answer some of them for you ! 1.What is your eye condition ? I have a form of albinism and I have some other issues with my eyes as well, like nystagmus, astigmatism, strabismus, pressure issues and iritis. This has caused me to have low vision my whole life and it took a turn for the worse and I lost my vision completely. 2. What do you see ? I only see small amounts of light, I can not see shadow or movement. My eyes are very very light sensitive, even though I only see small amounts of light, that light causes me a lot of pain. This is why you will always see me wearing sunglasses even inside. The sunlight feels like my eyes are burning and very painful, even lights inside can cause me pain and usually do, this then causes me to have a headache for hours and days on end.A good way to kind of get a sense of what I see according to my eye doctor is to close your eyes, you can tell that the light is on but that is about it. 3. What is the craziest thing you have done ? I think it is snowboarding, people are always amazed that I snowboard. After they get over the shock they then think I have lost my marbles. 4. How do you want people to help you ? Is it helpful or just annoying when people take your arm or describe things to you ? I like it if people ask me how they can help me in that specific situation, and let me make the decision if I truly need the help. I am always willing to ask or explain how someone can help me. I also want people to respect when I say no. There have been many times when I have said “no thank you, I am fine right now, but thank you for asking”. And people have questioned whether I am ok and they think I really need their help. I may look like I need help to you but in fact I do not, I just go about doing things differently sometimes. I never find it annoying when people are describing things around me at all. I enjoy it when people are willing to describe things like it is a normal part of their day. I will always appreciate it when someone does this. I do not want people to take my arm ever and lead me around, I will ask to take your arm if I feel I need it. In most situations I will have my dog follow you and if I need to take your arm I will tell you how to best guide me. 5. Are braille buttons in elevators useful ? YES !!! Every elevator is set up a little differently so when there is braille on the buttons this takes away the guessing of which floor I am going to. It is even more helpful when you get off the elevator and the doors to the hotel rooms or conference rooms have braille on them. 6. How does technology help a blind person ? How does it frustrate you ? Technology has made it so that I can do almost anything that a sighted person can do. I am able to use a computer, phone, iPad with the help of a screen reader. I am able to travel independently to new places using a GPS device, I am able to get help figuring out grocery items through an app called BE my Eyes. (All sighted people should sign up as a volunteer). I am able to read books on my phone with audio apps, more and more books are becoming available on audio format. Technology does not really frustrate me, the people behind the technology frustrate me. There are so many websites that are in accessible due to the way they are designed. If all websites were accessible I could access them and there is nothing more frustrating than having to ask for help because someone has designed something in accessible. In this day and age every web page should be accessible. Also PDF is a major frustration, so many people send things in PDF and I can not access it, a screen reader can not read an image it can read text. 7. How are you able to know if you are opening a can of beans or a can of peaches ? I personally use a pen friend to label my cans. This is a device that looks like a large pen, you put it over the re-recordable labels and it will read whatever you have recorded on the label so peas, beans, peaches etc. Before I can put that label on I will ask my husband or kids what it is or use the app Be My eyes . If I go to the store to buy canned goods I will ask the store staff to help me get what I am looking for. 8. How old do you have to be to be able to get a guide dog ? It depends on what school you go to to get your dog, but a general rule would be 16. But the most important part of the process of getting a Guide Dog is that you need to be very independent with your cane skills. So you need to be able to navigate to many different places using your cane on your own. You need to be able to cross difficult lighted intersections without audible crossings. It is a lot of work to have a guide dog and get a guide dog but it is worth every minute of it ! Thank you to everyone who submitted questions, I love answering your questions because that is the best way to truly understand how to help someone with a disability. It will also be what helps people to understand I am a capable independent woman living life just like you are ! Things like this happen all the time to people who are partially sighted or blind. I have also used the response to some people “What does blind look like ?”. They never have an answer for me, this is because they don’t really know what blindness should look like. Assumptions like we are all older males that wear dark circular sunglasses and bump into things with a cane or we all have cloudy looking eyes, these are all things that are assumed. This is the farthest from the truth, my eyes are not cloudy because I don’t have a condition that causes this, yes I wear sunglasses but it is because I have extreme light sensitivity and it is agonizing if I don’t. This does not mean that I don’t go to events and places without my sunglasses and when I do my eyes look fairly normal. They bounce around because I have a nystagmus and they are not always looking in the same direction as each other and my pupils are always really really dilated. However none of these things are what cause the vision loss, it is what you can not see in the back of my eyes. Being told that I don’t look blind does not hurt my feelings or offend me. However when you question whether I am truly blind this is what will send me over the edge in about 2.5 seconds. I am not sure why anyone would pretend to be blind, it is not glamorous, it does not get me things that the sighted community does not. 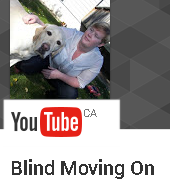 What it does get me is people asking whether I am truly blind, people questioning my ability to be a mother, employers looking the other way when I apply for a position, people petting and fawning over my guide dog when I just want to buy tampons in peace, people questioning my ability to live an independent life and do simple tasks for myself. So if you figure that I would go through all of these things in my day to day life just to pretend to be blind then you are sadly mistaken. The one thing that I want people to know is that Blindness does not discriminate ! This means that no matter you age, gender, race you can become blind or partially sighted ! And the only thing that may change about the way you look could very well be the addition of a white cane or a guide dog ! I have been very busy over the last few weeks, running in the Provincial Election here in Saskatchewan. This was something that I could never have imagined doing a few years ago but I am so glad that I was able to do it. When I was approached to run in the election, I really doubted my ability to do so. After some consideration and speaking to many people about whether this was something I should do or wanted to do. I decided that I wanted to take it on, and use my voice for something good. I wanted to try and make changes and be a part of those changes. I also wanted to represent the disabl ed community. The campaign process was intense and it was definitely a roller coaster of emotions. I put everything I had into the campaign. The hardest thing about the whole campaign was having complete strangers asking me how I was going to be an MLA if I was blind ? as well as people treating me like I was not serious or did not have the ability to be running in the election. I got a lot of comments like you are so brave and this must be so hard for you. I even had a few people who would speak to the people I had with me rather than talking to me. This is one of the reasons that I wanted to run in the election, to help prove these stereotypes wrong. I have said many times that my vision does not dictate how I live my life and it will never determine what I can and cannot do. I did not win the election but I had a great campaign and ended up getting quite a few votes and not doing too badly. This was an amazing experience that showed me and hopefully the people around me that disability does not mean lack of ability. This is also not the end for me. I will continue to fight the stigmas and stereotypes of blindness. I will continue to tell my story in the hopes it will help anyone who is going through vision loss and feeling like they can not live life to it’s fullest.